What thoughts come to mind when someone mentions the city of Las Vegas? 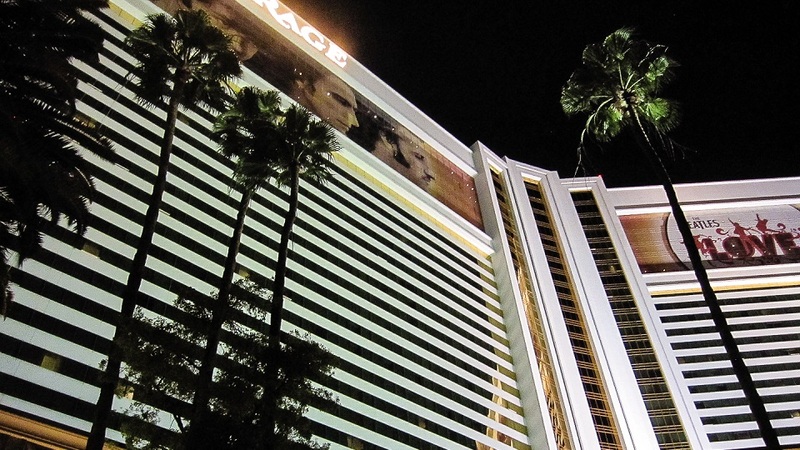 Casinos, gambling, neon lights, and massive spending? Those are some common immediate thoughts that come to mind for many people. While they aren’t necessarily wrong, you can easily do without the massive spending. And if you aren’t the gambling type, believe me, you have even MORE of a reason to visit sin city, because you’re already less likely to leave broke. 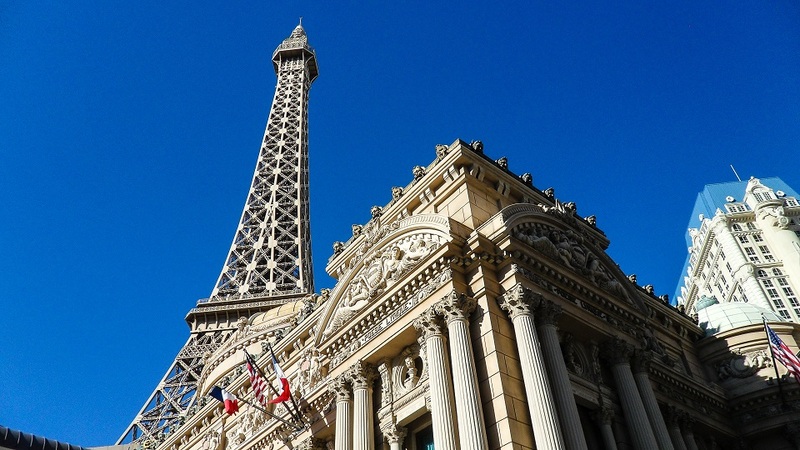 Here are 10 free activities in Las Vegas that you can do next time you visit. You’re probably thinking “People watching? Really!? I can do this anywhere!” and while that’s true, I need to tell you that people watching in Las Vegas will give you a much better show than almost anywhere else. The variety of people in this city is astounding, during my trip I realised that there really isn’t much of a “minority” of any specific kind of people. Whether it’s ethinicity, age, size, wealth, sexual preference, fashion, etc. You will see a lot of everything here. Time Of Day: Always happening, night-time is suggested. Why is this even considered an activity? Cabs are expensive, the Deuce is pretty cheap ($8 for 24-hour access to the bus), and if you can afford a limo, you’ll be stuck in traffic in style, but you can also get a lot of free transportation. 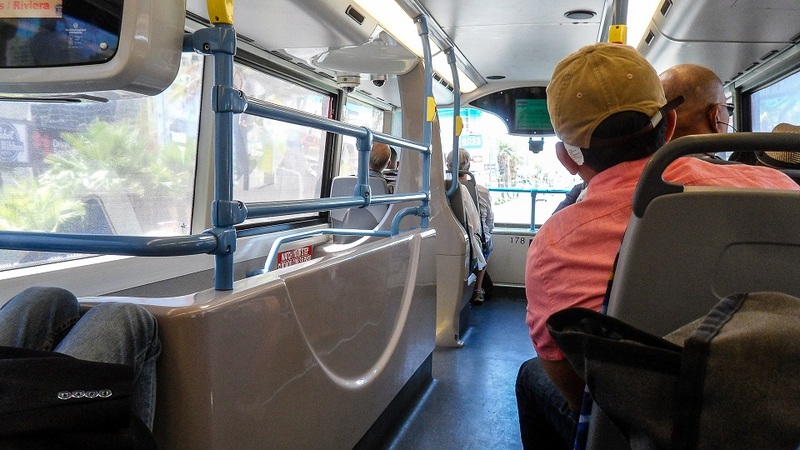 There is the Express bus that runs from the Welcome To Fabulous Las Vegas sign all the way through the strip and to Fremont St. which doesn’t necessarily require a bus pass, this allows you to do A LOT of sight seeing for free! Though I purchased the $8 bus pass every morning, I didn’t need it once to ride the Express bus. You can tell the difference because the Deuce, which is a double decker and the Express, which is a single level with a bend spot in the middle. There is also complimentary monorails that travel between certain hotel/casinos like the one I used most often that went between Mandalay Bay, Luxor, and Excalibur at no cost. It also serves up some nice views. Time Of Day: Whenever needed. Love chocolate? 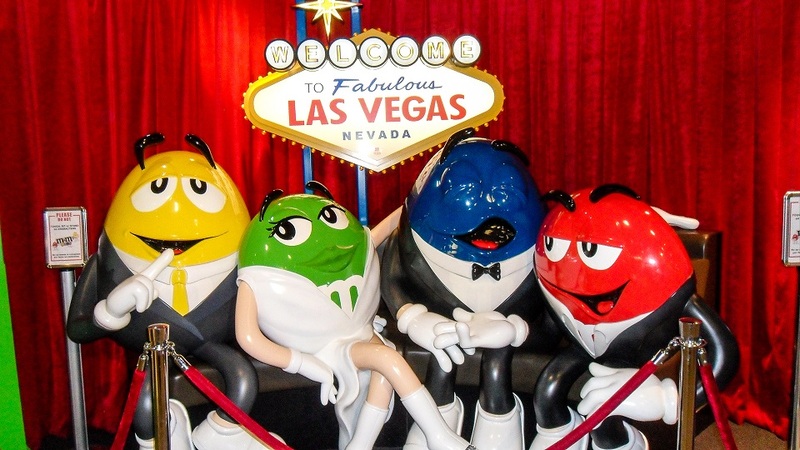 Want to learn the history of M&M’s or see some crazy stuff the Hershey company makes? The Hershey’s store located at the New York New York Hotel & Casino offers you many amazing sights (like the Statue of Libery made out of 600 lbs of chocolate) and products (like the 5 lb Hershey bar). The M&M store located across the street and a block over, will give you 4 floors of M&M products and the history of the M&M. The 1st to 2nd floor escalator was my personal favorite, as it showed the progression of the advertising phases for M&M’s. Time Of Day: Generally around 9am to Midnight depending on store. So this is an obvious one, but still often overlooked when you arrive in Las Vegas and get stuck drinking and gambling the nights away without realizing an entire week has flown by (this city does a great job of making you forget the concept of time). You can visit New York city (New York New York), Paris (Paris), ancient Egypt (Luxor), Venice (Venetian), ancient Rome (Caesers Palace), a desert oasis (The Mirage), a circus (Circus Circus), a medieval castle (Excalibur), and a tropical paradise (Mandalay Bay), all within walking distance! Don’t forget, while the casinos are built to make money, you can save yours and treat them as adventures instead! Also, check out the artificial environment of Caesers Palace, where you can experience several days and nights and even catch a thunderstorm all while spending just a few hours window shopping and eating! 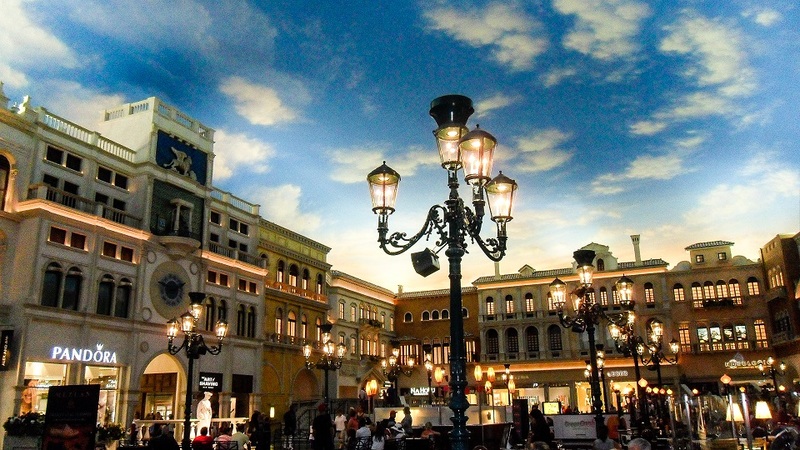 Pick a table along the street side, order up some pizza, and catch a performing street act near a Venice river while you’re inside The Venetian Hotel & Casino! Yes, I said INSIDE! You don’t need to worry about the heat, sunburns, and dryness of the desert to enjoy walking “outside” along a river and enjoying some “unnatural” sunlight and moonlight! Time Of Day: Throughout the day, times unknown. 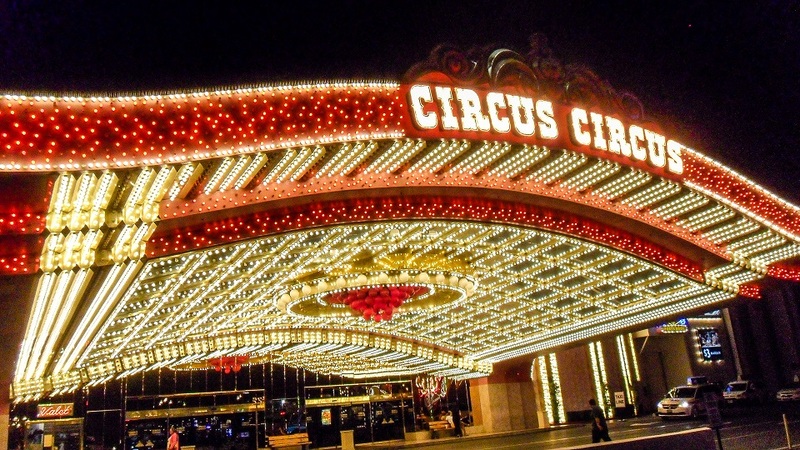 While it isn’t arena seating around a giant 3 ring stage, you can still enjoy a great circus show inside the Circus Circus Hotel & Casino. Throughout my 3 night stay here I didn’t see the same performers twice, so this could repeat every week, or less often. 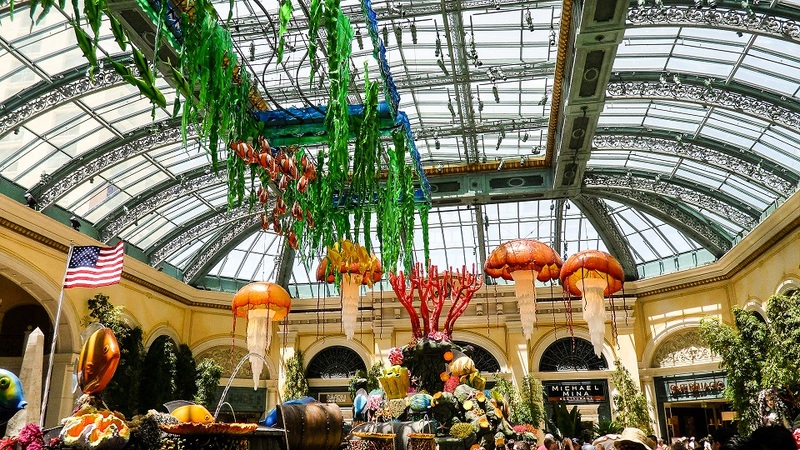 While not as impressive as the other Bellagio appearance on this list, the glass flowers that greet you when you walk in the main entrance and the interior garden are stunning! The garden changes over time, so always expect something different when you visit! Time Of Day: Always happening, day-time is suggested. Want some fountains along with fire? The volcano at The Mirage Hotel & Casino is a show not to be missed. You’ll being to hear crickets and frogs and other sounds of nature getting louder and louder and louder, and then complete silence. My personal take on this is that animals can sense danger, because a moment later the volcano will begin to light up and rumble and gives you one hell of a show! I made time to catch a 2nd viewing! Time Of Day: Sundown until midnight in 30 minutes intervals. The best way to describe Las Vegas is to say it’s a real life twilight zone, an alternate reality, a place that transcends both space and time. 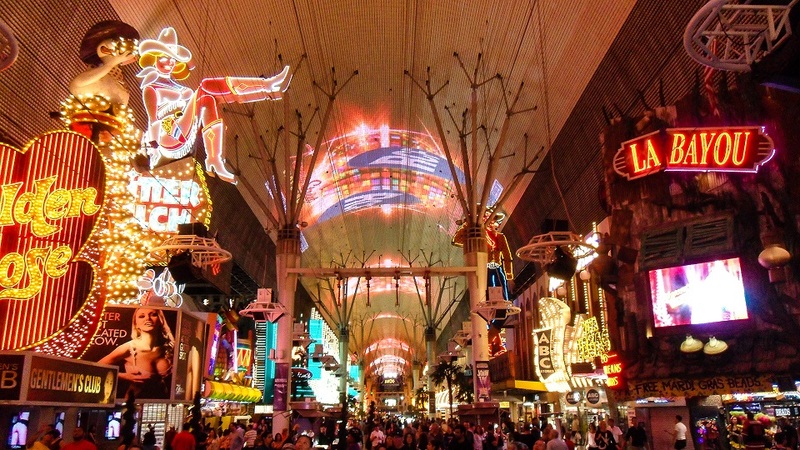 The best way to describe Fremont Street, is that it’s the soul of Las Vegas. Which (as you can imagine) can be very frightening and exciting at the same time. 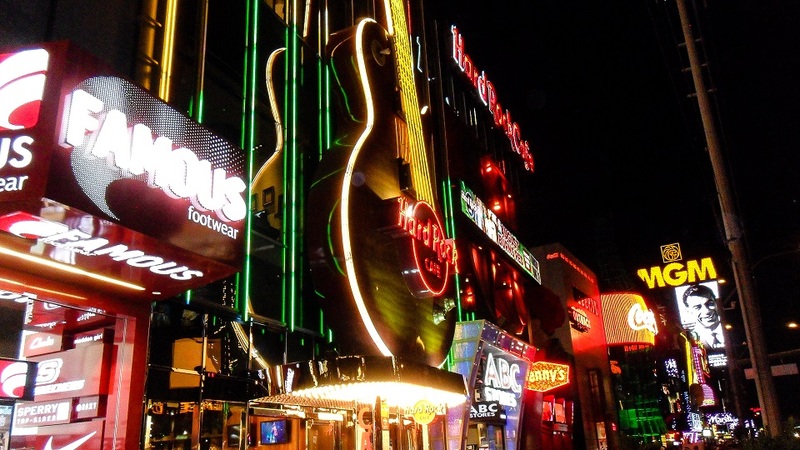 Spend enough time on Fremont St. and you will become desensitized to the weird, bizarre, and extreme. I’ve become a little more numb since walking down this street only once, I saw some truly freaky things. If/When you decide to take a stroll down Fremont, brace yourself to see things you’ve never seen, or atleast not in person. There are friendly people, crazy people, homeless, rich, some of their bodies modified, some are covered in tattoos, some are running around naked, some are drunk, some are sober, and while none of this is necessarily bad, or that maybe you’ve seen these things in person, they all come together in one spot and in large amounts here. One viewing and I saw 3 concerts all taking place in different locations at the same time, people zip-lining above my head, the giant screen that runs the 2 famous blocks, a girl with actual horns protruding from her forehead, a man levitating on a pole, a homeless man spray painted in gold spraypaint, bunny girls, cat girls, strippers dancing outside, various street performances including people hand tapping buckets, another man spewing profanity into a microphone (for no apparent reason), prostitutes, a couple random animals with no apparent owners, a few rich folks, and many many shady folks. I hold nothing against anyone or anything I saw, I loved this place because when you’re here, everyone is equal, no matter how weird people may view you outside, and it’s a pretty amazing feeling! Las Vegas is certainly a bubble, a fantasy world. This is the best thing I experienced in Las Vegas. On TV, online, in movies, everyone always mentions the fountain show at Bellagio, so I figured it might be over-hyped, but I should see it anyway…. Well, this is certainly not the case. There’s good reason why this is loved by so many, it truly is an amazing thing to see. This is not something you will “like”, it is something you will “LOVE”! While there is a billion and one things to do in Vegas, I made time to catch 7 shows of the fountains, the only other thing I gave additional time to experience again was of course the Volcano at The Mirage as mentioned above. I cannot put into words exactly what it is that makes this so amazing, but even if you only have time for 1 thing and 1 thing only in Las Vegas, do yourself a favor and make sure it’s the fountains at Bellagio! Time Of Day: During the week you can catch them after sundown until midnight in 15 minute intervals. I’m not sure the weekend schedule. Many people suggest the pirate battle at Treasure Island however, this has not been performed in over 2 years due to ownership change (according to a TI Hotel & Casino employee I spoke with). ← Previous Previous post: 10 Travel Inspiring Movies! Next → Next post: Want To See 15,000 Miles Of Neon Lights? Love the fountains! Easily my favorite part of Vegas.